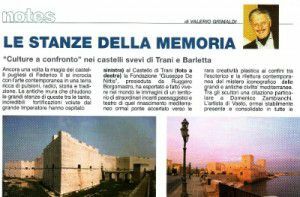 The De Nittis Foundation – in collaboration with the Ministry of Monuments and Fine Arts – having created in the 2003 the “Quadreria (Picture Art Gallery) of Trani Castle” thanks to a donation of 37 artworks from national and international artists, anticipates an enlargement of this Quadreria. During the exhibition, the art director Valerio Grimaldi will select some of the participant artists who will have the chance (under their agreement, of course) to donate one of their artworks that will become part of the permanent collection exhibited in the Museal Rooms of the Castle. 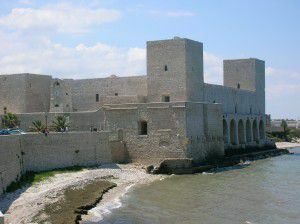 The Castle is a tourist destination for over 100.000 Italian and foreign visitors every year.